CINCINNATI — One of the first things people notice when they walk down the 800-foot-long “concourse” of the University of Cincinnati's Aronoff Center for Design and Art, is Alan Marrero’s figurative sculpture, “Ethan,” which has been on view since 2005 in the home of the College of Design, Architecture, Art and Planning. 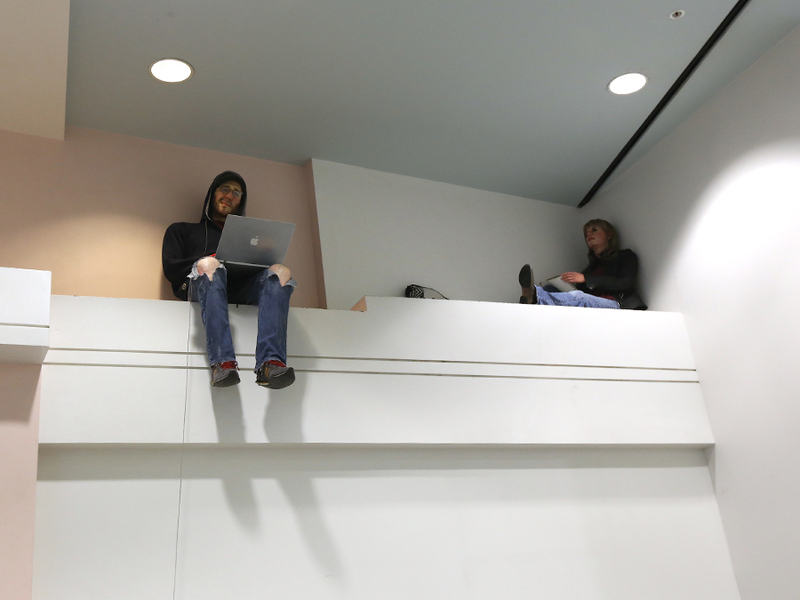 For 11 years, one of the few signs of life and infamous way-finders in that building has been this realistic looking sculpture of the ubiquitous DAAP student, perched on a ledge that the building’s architect, Peter Eisenman, likely never foresaw might have some use to the student body. 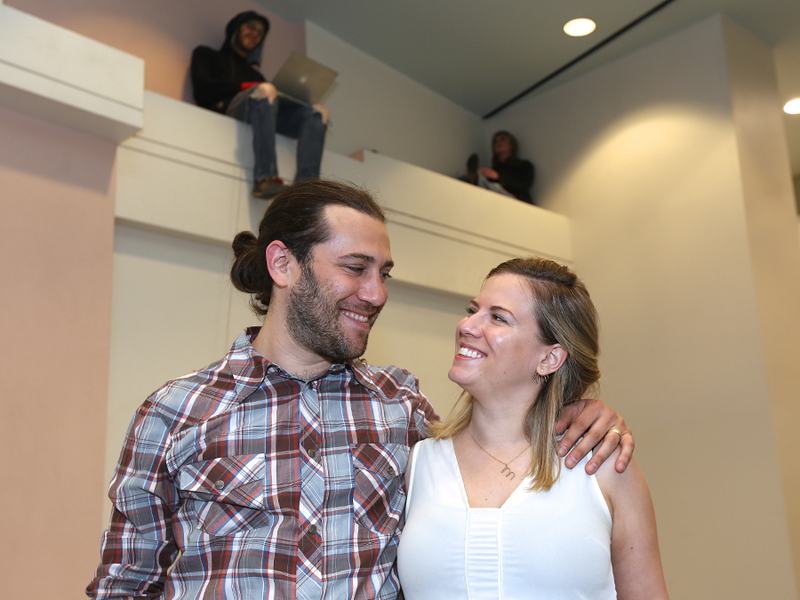 “Ethan” nevertheless has become a kind of touchpoint for students, and DAAP administrators are reinvesting in their original, commissioned piece. Marrero was back in town last week, giving his beloved figure a much-needed formal overhaul and adding a female DAAP-ster, created an homage to the artist’s wife, Mary, who also attended the school. 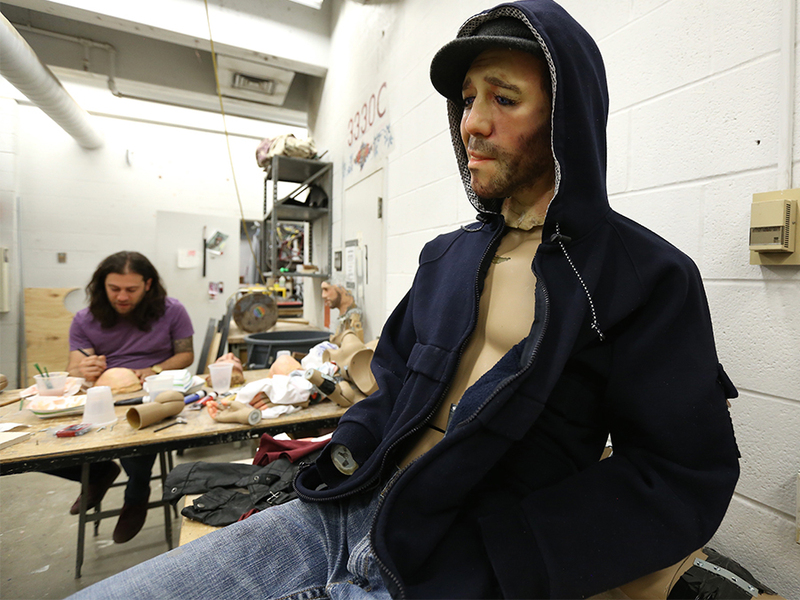 Alan Marrero works on the final touches of the new "Ethan" sculpture in a DAAP studio. Emily Maxwell | WCPO. 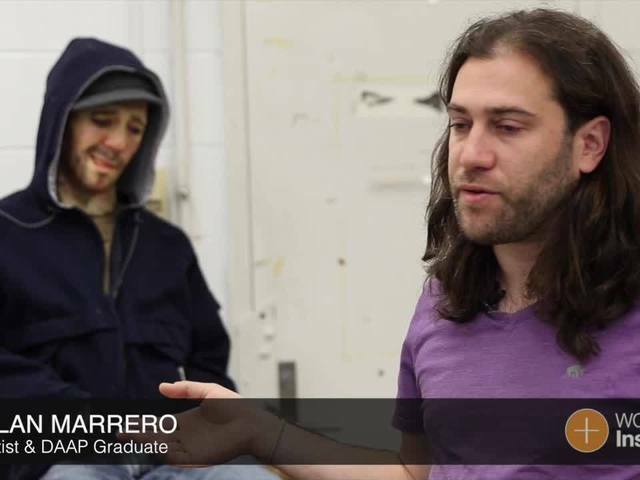 Marrero was a junior planning major at UC when he took a studio course with sculpture professor Matt Lynch. It proved to be the catalyst for the creation of the now well-known sculpture. As his first assignment in the installation class, Lynch customarily challenges the students to invade the public areas of the building. Since the ledge where “Ethan” is perched is not a reservable space in the building, no one really had the authority to allow (or disallow) this kind of an installation. He made the figure in just three days with mostly things that he found around him, as the initial run of the sculpture for the class was only supposed to be a week. “I started pulling out scraps from the wood pile over here,” Marrero said, motioning to the woodshop area just outside of the sculpture studios on the 3000 level of the building. The artist made a rudimentary armature with wood scraps, wrapped it in chicken wire and made a plaster of Paris mold of his own face for the sculpture. “It was never really meant to be a self-portrait,” Marrero admits. “I was the only person around willing to put plaster on my face,” he said with a chuckle. He used his old clothes to dress “Ethan” and avoided the need for a wig by using a hat and hoodie to cover all but “Ethan’s” face. He said the only thing he actually spent money on for the piece was for a $4 can of spray paint to paint “Ethan’s” “laptop” — a required accessory for any DAAP student. An oft-repeated story regarding “Ethan” took place during the work’s first week of installation. It involved a professor and former dean of the school yelling and causing a scene in an effort to coax the would-be student down off the ledge. Once “Ethan’s” week-long exhibition run was up, the responsibility fell into the hands of then-Dean Judith Koroscik who asked Alan to make a gift of it to the school in exchange for a small amount of money in art supplies. Even though he took a different art studio class every year, Marrero graduated the following year with his degree in planning; he now lives in Seattle, where he works for a lighting-design company that does a lot of custom installations. “That’s a big creative outlet,” he said. There has been a renewed interest in recent years in “Ethan,” and the figure seems to have become a good luck charm or patron saint of the school: Prayers on Post-it notes are often left on the wall, and people leaving lighted candles at the foot of his ledge around finals times hoping to ensure good grades. Over the past holiday season, some friends from high school suggested to Marrero that they propose a new and improved version of “Ethan” to the school. They wrote to current Dean Robert Probst, asking if there would be any interest in hiring Merrero to redo it. There was a little back and forth, and Marrero met with Probst a few days later to discuss the details; a formal proposal followed. It involved including his now-wife Mary’s doppelganger, “Violet” (a variation on the English translation of her Czech maiden name, Fialko), and she has now joined “Ethan” on his ledge. Anyone wanting to see the sculptures can visit UC's Aronoff Center for Design and Art from 8 a.m. to 7:30 p.m. Monday-Friday and 10 a.m. to 5 p.m. on Saturdays and Sundays.